Last night I took part in some of the Horror Lounge events (where there is also an interview with me). I also ran one event, focussed on the books of Dean Koontz. How did I discover him? I first heard of Dean Koontz when I was given a second-hand copy of Phantoms by my grandmother. I was gripped from the very first page, and although I'd read scary stories before, I'd never read anything so absorbing. I curled up in an armchair and just kept reading. I love a book with a good concept. In Phantoms, two women drive into their hometown. Night. Winter. Lights are on. But no people around. It gets weirder and weirder. It's a big town. Where is everyone? 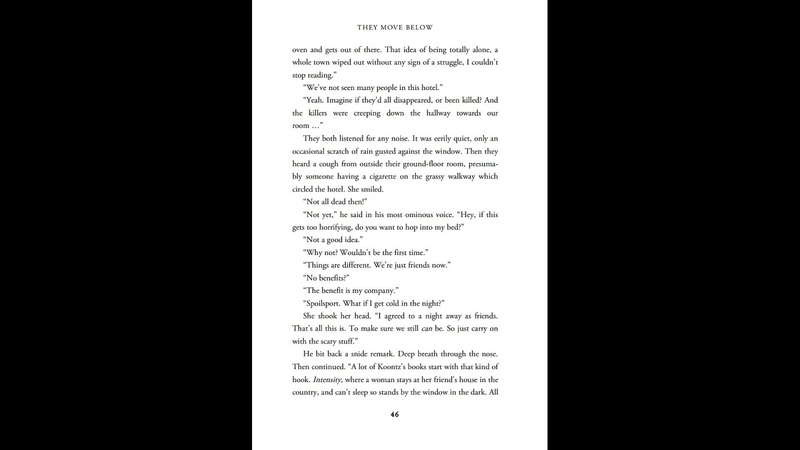 By page two you are already caught up in the mystery, and you've started to care about the characters and put yourself in their shoes, because everyone goes to their hometown. 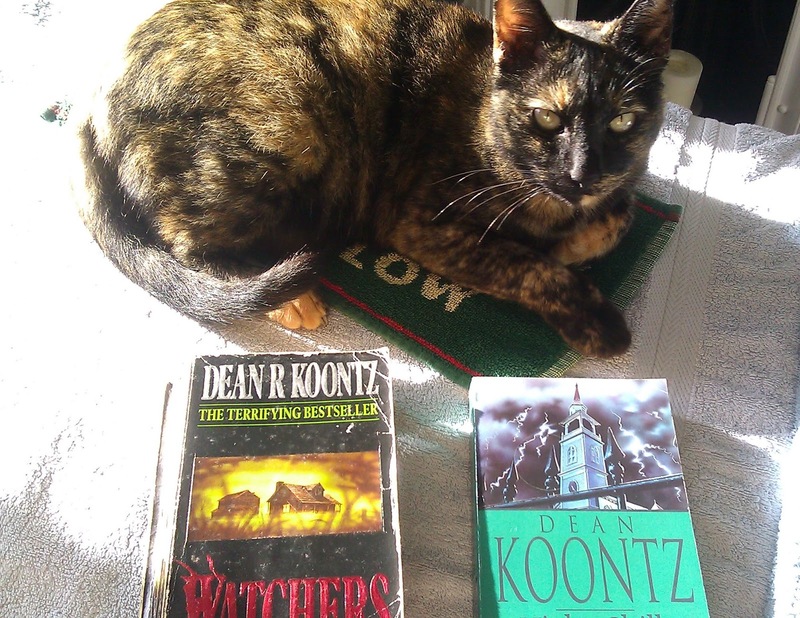 I think Phantoms and Midnight are my two favourite Koontz novels (and partly inspired me to write Turner) - though other Koontz books such as Intensity are great at "doing what they say on the tin", an impressive match of form and theme. I loved the way Koontz novels would open with either action or tension, then ramp them both up along with the stakes throughout the novel. The ideas also grabbed me. Ever-living protoplasmic beings of unstoppable power? Human-computer interfaces for emotionless killers? Wow! They were books I could not put down - and that's a huge part of what makes a good book. Both books impressed me so much that I ended up basing the opening of one of my stories around two people trying to scare each other in a hotel room, and because the guy is trying desperately to terrify the woman into his bed (which obviously doesn't work out well!) he starts by talking about Koontz books. That's how much they stayed with me. 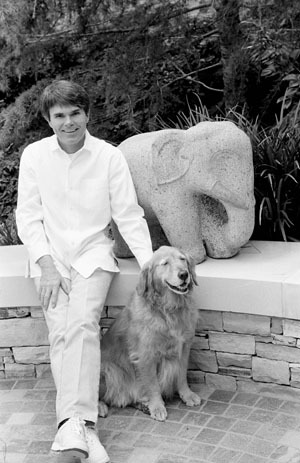 Dolly says: "Notice how he rebranded himself from Dean R Koontz to just Dean Koontz"
I read a lot of King and Koontz books. I was interested in their similarities and differences. They scratched different itches. In a way it's not just style, but story choices. At least in how I used to perceive them, since I spent all my pocket money on books by those two authors! Certainly back in the 80s and 90s I felt that Koontz generally got down to things straightaway, cutting in with immediate action (as in The Bad Place, almost a perfect template for his thriller/horror crossover - it begins with an action car chase). Whereas King would spend a lot longer building up the story. Less of a shock, more of a build-up of shudders with King (e.g. think about the opening of It, or The Shining). Koontz also usually offered some kind of scientific explanation, however goofy, whereas King was happy to allow a hidden supernatural world without it needing explaining. These bad things just exist. I enjoyed both approaches. We always think of Stephen King as being the one with lots of films made of his books, but then I found this list: Scare Yourself with Movies Based on Dean Koontz Thrillers. Yep, there's been loads of films of Koontz books too, so there are quite a lot of options for watching his stories on the big screen over Halloween! I have a hobby of matching films to books that seem heavily related, but aren't officially connected. 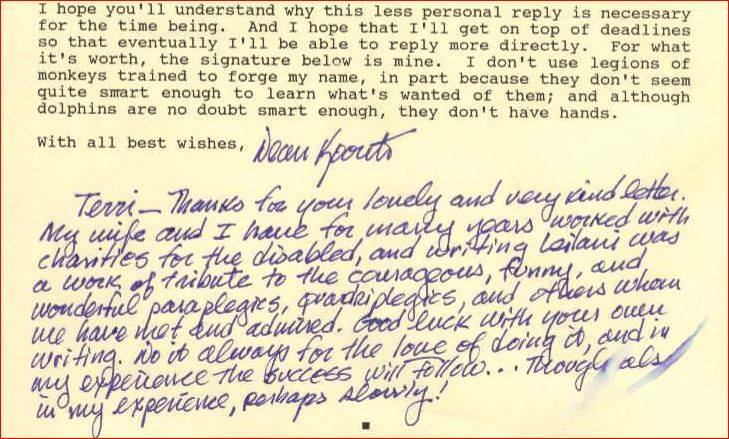 Dean Koontz was legendary for being open to his fans: I remember reading how, long ago, he even made photocopied, quirky newsletters for them. He was ahead of the game there. 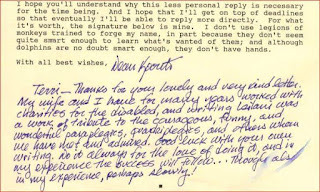 I spoke to fellow author Terri Nixon yesterday [Twitter / Facebook / Website], and she told me Dean Koontz once wrote to her and gave her a piece of advice she looks at every day when she is writing. Great advice, presented with humour. Great stories that don't disappoint.